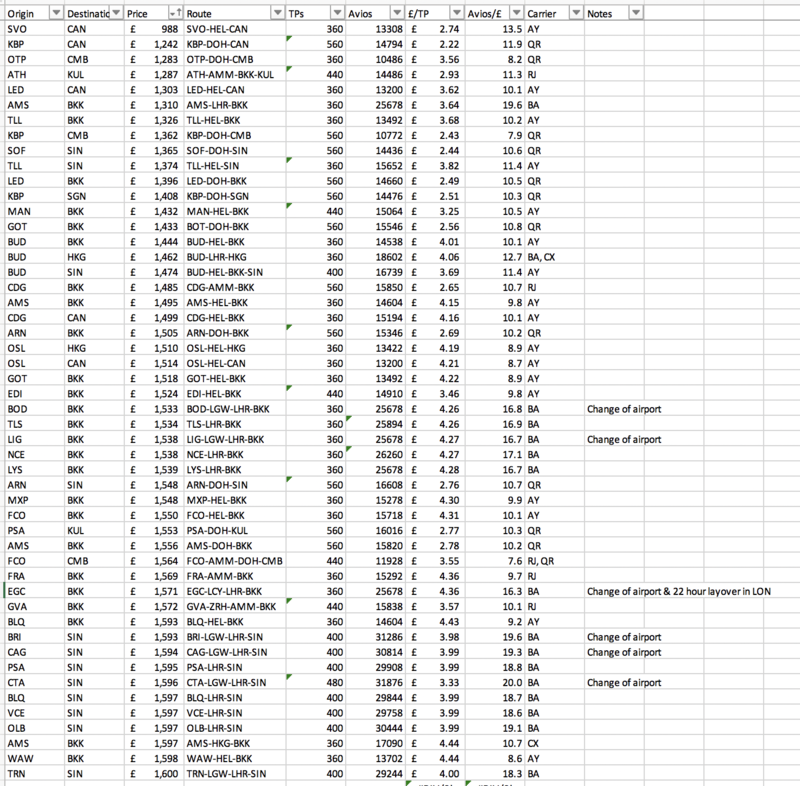 I did a similar search (EU to BKK, similar dates) on Bright Flights (which searches all major EU departure airport options on ITA Matrix as one search) and downloaded the attached spreadsheet that shows estimated TPs and Avios for each of the flights also. (in my case it also shows connecting flights to from/ to LHR as that's my home airport). Hope this helps. Sorry if I have done something daft. Depending on the flexibility of your dates, you could do DUB-LHR-JFK return in BA business class for £1,360. That's a very good price for that time of the year and I'd be surprised if it came down much more than that. I also found LHR-JFK in PE on AA for £1,010. See attached for the some of the alternatives I found in both business class and PE. Thank you for helping. A grand for PE seems very steep to me considering J on an A350 is only £200 more. If PE ex-LHR was ~£750 I would probably do that and keep an eye out for CW avios availability but if belief that PE/WTP will stay at levels over £1k I will treat myself to J.
all these fares are great but midweek LHR-IAD pretty much any time in 2019 without a Saturday night stay is stuck at over £6k, with LH and OS offering £3k. Any chance of this changing, or are sales only targeted at leisure travelers? Any chance of additional columns for Avios and TP earning ? I did start but then stopped the moment I found the MXP-BKK fare. This was for flights in August: (the Avios column reflects my earnings a BAEC Silver). This was also intended for going to KUL/SIN. No problem at all. The website is https://www.bright.flights/ You just need to sign up for a free trial account (no credit card needed) and then it makes the search tool available. The inputs mimic ITA matrix inputs (all the way to american date format). It's a bit temperamental (if the search is too complex it times out on occasion) but it saves a lot of manual searching for alternative departure airports so great for bargain hunting on long haul flights. .
hsmall and StanStorby like this. This is new to me, never heard of it before. Anyone else played with it already? Site seems to be registered since last August. Also in the terms it seems to suggest it isn't permanently free. A valid credit card is required in order to sign up for a paid account after free trial period. You are allowed to cancel your service during the 3 day free trial. After the 3 day free trial you will need to upgrade your account to the paid version if you wish to continue to use the service. I think that indicates the site owner is an individual as I didn’t think a corporate could redact contact details. The terms of business are also opaque and doesn’t specify who the contact is with ie what is the legal form of “Bright Flights”. A lot of WHOIS privacy type things these are to do with GDPR more than anythign so I wouldn't read much individually into that. I actually know the guys who built Bright Flights. Like me they fly a lot of long haul flights and are London based and work in startups/ tech - I think they did it as a side project. I think it only went live about a month ago. I've used it for some Q1 flights for NY and HKG as I'm happy to go Ex Eu as I tend to pay for my own flights but still like to travel in J so I'm happy for flight starting points to be AMS, CPH, etc if it means I save 30-50% on the ticket vs flying from LHR. I did the 3 day trial and then signed up for the £3.99/ month subscription as I have an ongoing need for the tool and I know the guys are paying for server costs etc out of their own pocket so want to support the running costs as it's a great tool for me. When you do the payment (it's done via Stripe), you get an invoice with their personal and ltd company name and contact details etc on it. So I think pretty safe. What I use it for is to find 'good ideas' for flights and then go to ITA matrix to dig out the details for those same flights and then find a site that comes closest to actually selling the same flights at that price. So it's a starting point for my searches and then I switch back to my normal tool kit. Hope this helps! StanStorby, cgtechuk and wilsnunn like this. I signed up and it is useful. Doesn't like it if you enter a different currency I.e GBP but is a good as a guide. Just a shame there do not seem to be any decent fares to SIN at the moment to find! Just tried bright.flights and it's not showing the cheapest of the departure points, only the fare from the first airport input, i.e. AMS is the first airport code, but I know ARN is cheaper for my itinerary, but only fares from AMS are displayed - have I missed something as I thought finding the cheapest departure point across several countries was the main purpose of the site, now ITA has stopped this. Are you cutting and pasting the list from the site? I noticed there us a full stop after one code so I changed that to a comma. Seem to get all codes for me. one thing I've found that the price of the flight might be cheaper but if the total price is more I.e including the positioning flight it orders them by total price. Would be useful to turn off the position flight option. I was using it today and had the exact same thought, the positioning flight seemed very expensive most of the time. EDIT: just realised why, they are all in CE, when I would probably fly ET on that route.